﻿ Le Méridien Pyramids Hotel & Spa Giza. JIMAT di Agoda.com! Ada soalan mengenai Le Méridien Pyramids Hotel & Spa? Sama ada anda melancong atau ke luar kawasan kerana kerja, Le Meridien Pyramids Hotel and Spa merupakan pilihan penginapan hebat ketika melawat Giza. Dari sini, tetamu boleh menikmati semua kemudahan yang bandar ini tawarkan. Pelawat yang datang ke hotel boleh melawat tarikan utama di bandar ini seperti: The Grand Egyptian Museum, Pyramids of Giza, Great Pyramid of Cheops (Khufu). Di Le Meridien Pyramids Hotel and Spa, perkhidmatan yang cemerlang dan kemudahan yang unggul menjadikan penginapan anda tidak dapat dilupakan. Hotel ini menawarkan meja depan 24 jam, fasiliti tetamu kurang upaya, daftar masuk/daftar keluar ekspres, simpanan bagasi, Wi-Fi di tempat awam untuk memastikan tetamu menikmati keselesaan yang terbaik. Semua bilik tetamu menawarkan pelbagai jenis tahap keselesaan. Banyak bilik turut menyediakan televisyen skrin rata, penyaman udara, pemanas, panggilan kejut, meja untuk memuaskan hati tetamu. Hotel ini menawarkan kemudahan hebat, termasuk tab panas, pusat kecergasan, sauna, kolam renang terbuka, spa, untuk membantu anda berehat selepas hari yang penuh aksi di bandar. Le Meridien Pyramids Hotel and Spa merupakan tempat yang ideal bagi penginapan pelancong yang mencari keindahan, keselesaan dan kemudahan di Giza. I simply liked it .. great package of services and room .. 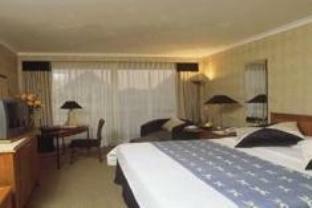 The hotel is in the best location just by the pyramids so it is easy access to visit them. The rooms were clean and I had a nice view of the pool from my room. I would definitely stay at the hotel again. The room doesnt have slippers and carpet was dirty/dusty. I requested slippers on two seperate occassions. First time i spoke to a chambermaid and second time called the room service. Both time i was reassured it will be delivered. I was still waiting for my slippers on the way back to my airport. is that I stayed too short here and that I didn't get to enjoy the pool. Definitely get the Pyramid view... Its awesome!!! The hotel offers good dining options, and the staff is helpful and friendly. The spa and fitness center are well maintained and offer the perfect compliment of relaxation and luxury. Their food policy is ridiculous amd their key system is more ridiculouse. You have to hide your food in your luggage in order to get it into the hotel. And their room keys "cards" work 10 percent of the time. You have to reactivate the card everyday. The employees always want money and seem unprofessional. I would not recommend staying there, pay a little extra and go somewhere better with more professionalism. Stay was good, but unfortunately we were not given interleading rooms with our young children: told on numerous occasions that it was not available , and placed on a smoking floor the first night. I wonder whether they read the requests that are submitted??? Also, make sure that you book a renovated room. The older rooms are not as nice. There are no hairdryers in the rooms. No irons. But can be requested. Wifi in lobby is extremely slow. No wifi in rooms. They DO NOT vacuum the rooms on a daily basis . We accosted the poor cleaner to vacuum our room! The fitness centre is really good. Pyramid view rooms are stunning. Came for the view but it's really quite underwhelming. If you are a single traveller, they will put you in a corner room that looked like a prison cell even if you have paid for a premium room with view. And it's still quite a distance from the entrance of the pyramids , not 700meters as described on webpage. Internet connection as ancient as the pyramids. The Le Meridian has a lot going for it. 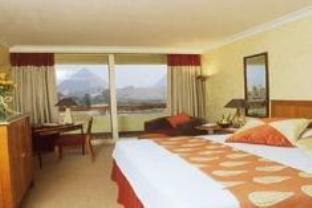 Beautiful location overlooking the pyramids, a great pool and spa facility, and easy access to the pyramids. They were also helpful to let me leave my bags there overnight when I went camping in the desert (which request they initially refused). The dinner buffet was average at best and unremarkable in any way. However, our stay was overshadowed by the very poor wifi connection which they provided in the lobby. The charge for wifi in the room was exorbinant, so we relied on the free signal in the lobby. But the signal was totally unreliable and frustrating. Even worse, when I complained to the manager, he took zero responsibility, and said that he couldn't do anything about it, because it was a 3rd party service. Sorry Le Meridien, you have to take responsibility for the services you claim to provide. I would have to think long and hard about staying here again, simply because of the wifi access.